It says “Number of Posts 80″, so I thought that meant the number of comments posted. Guess not. I didn’t find enough info in the chart to fully understand it. But it seems like conservatives’ view of liberals did not change. How come? Is that a trait inherent in conservatives, or a failure of the instrument to create positive views of liberals? apologies for the late reply and that the graph wasn’t easier to digest, but conservatives’ views of liberals did change. The Y axis represents change in views so any positive score represents positive change. The red bars are conservatives. 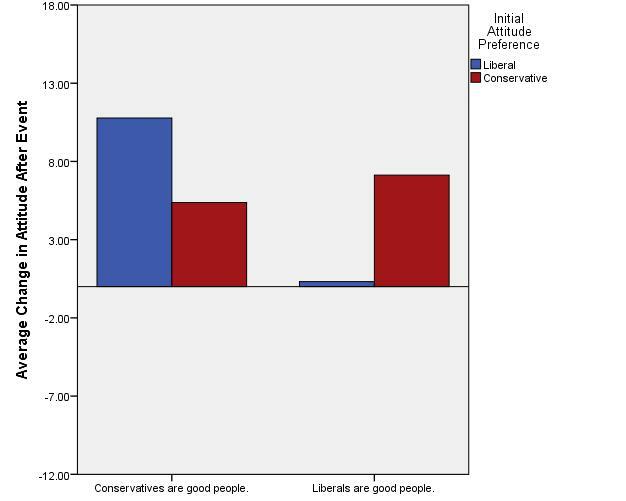 So conservatives did have more positive views of liberals after the event (see the red bar for “liberals are good people”) with a +7 rating, but the # of conservatives was not enough for statistical signficance. actually, conservative attitudes did change positively for those there, but the results weren’t statistically significant as a majority of attendees were liberal.